Although Fionnuala Britton is certain to run at the World Cross-Country Championships in Poland next March, she may well be on her own. Britton, not only double European champion but also part of the gold medal winning Irish team at the European Championships, had hoped that a team would be sent. At the Antrim International last week, she again proved herself the dominant athlete at this discipline in Europe at the moment. Half a minute behind in an excellent fourth place came Linda Byrne, another local athlete whose roots are very much in the mud and guts of cross-country. Byrne had finished sixth in a much tougher field at the Great Edinburgh Cross-Country a week earlier and was eighth behind Britton in the Europeans. Byrne, although she had shone on the roads in the past 18 months, is the current national champion, winning at Santry last February. She clearly believes that running off road makes her stronger and fitter for the track and the roads. Also on that winning Irish team in Budapest were Ava Hutchinson and Lizzie Lee, backed up by Sarah McCormack and Sara Treacy and with Kerry Harty very unlucky not to get the nod. That’s a strong squad – yet none of these athletes ran in Antrim, which is the only top class international cross-country taking lace on this island. Think of the welcome they would have got! Of course it’s a complex problem, with no easy answers. If an Irish team hasn’t a hope of taking a medal at the World Championships where the might of East Africa dominate, then why bother going? Far easier to aim for a spring marathon, where a personal best time is as good as a medal. Yet Catherina McKiernan, European champion and four times runner-up at the Worlds, didn’t think like that. Sonia O’Sullivan, double world cross-country champion, didn’t think like that. Paula Radcliffe, world cross-country champion and world record holder for the marathon, didn’t think like that. Yet, as it stands, when the World Cross-Country Championships rolls around, the champions of Europe won’t be there. And when our own National Championships take place next month who will turn out? For the eagerly awaited Athlone IT Indoor Arena, it’s all systems go from January 26, when the country’s increasing band of multi-eventers launch the facility at the National Combined Events Championships. A day later, our top athletes take on an international field at the Athletics Ireland Open Games. Events scheduled for the track are the 60m, 400m,800m,1500m, 3000m, 60m hurdles and 3000m walk. In the field, pole vault, high jump, long jump, triple jump, shot and 56lbs for distance are on offer. Entry is just €10 per event. The day ends with a 4x200m relay. Ultra runner Eoin Keith,who had set a new Irish 72 -hour record in the USA 12 days earlier, won the Art O’Neill Ultra Challenge in the Wicklow Mountains, with a time of 6 hours mins 35 secs. Meanwhile, World Jogger Tony Mangan is now in New Zealand, having completed his run across Fiji. Mick Traynor of Raheny Shamrock made it a home victory at the Dublin Masters’ Cross-Country in St Anne’s Park, beating Davey Byrne of Tallaght. Traynor, who is 48, also won the over 45 category and led Raheny to team victory. 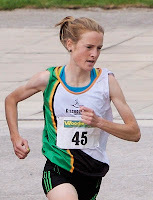 Jean Wilson of Sportworld won the women’s 3km with Donore’s Anne Curley second and Sportsworld best of the teams. Both races attracted record entries. Maura Ginty of Sportsworld won the women’s Meet and Train Winter League 2-mile in Bush Park, Terenure. This first ever cross-country in Bushy Park attracted a record 112 runners from clubs all over Dublin and Meath, including newcomers from Metro St Brigid’s. On the roads, Sean Hehir of Rathfarnham WSAF won the Tom Walsh Memorial 10km in Caherconlish, Co Clare in a new course record time of 30 mins 37 secs. Angela McCann of Clonmel celebrated her 42nd birthday with victory in the women’s race. Record numbers are expected at the Axa Raheny 5 on January 27. Thanks to a promotion that saw anyone who entered before January 9 getting a personalised race number, the number of early entries is well ahead of last year. The message is clear – if you want to be sure of a run, enter now!